51 Mechanics later (well, more like 45 when we exclude the few that don't really have a game-based or gamified learning application), we arrive at Worker Placement, one of the mechanics favored most by those on the highly dedicated end of the gamer spectrum. Worker Placement games are well known for their complexity. Indeed, some of the most beloved Worker Placement games are considered among the most difficult of contemporary games. In Worker Placement games, you are allotted a limited supply of pieces (workers), each of whom allows you to take a specific action. There are also a limited number of available actions and a limited number of opportunities to take each action (sometimes only one player per turn can take a particular action). This makes gameplay cognitively very complex and engaging...and also sometimes infuriating! Nominally a game about farming in early modern Europe, Agricola is one of the classics of the worker placement genre. It's actually somewhat helpful to play just out of the box to understand what the farmer's life in that time was like, but it can be bewilderingly complex, even for sophisticated gamers. There's a lot here, and the engine is very powerful or the right gamifying teacher. In Alchemists, you are playing, essentially, potion makers in training. Your job is to discern and publish theories about the correct formulas for certain kinds of potions, sell potions to unsuspecting adventurers and find the patterns of materials that will generate the best possible combinations. Fun out of the box, particularly for those who also like the game Zendo and its pure deduction mechanic. In Caylus you are building a new castle for the French king. As you build the castle, the city in which the castle is being built expands and develops as well, allowing for ever more worker placement opportunities. A rewarding game experience for those who want an intense experience. 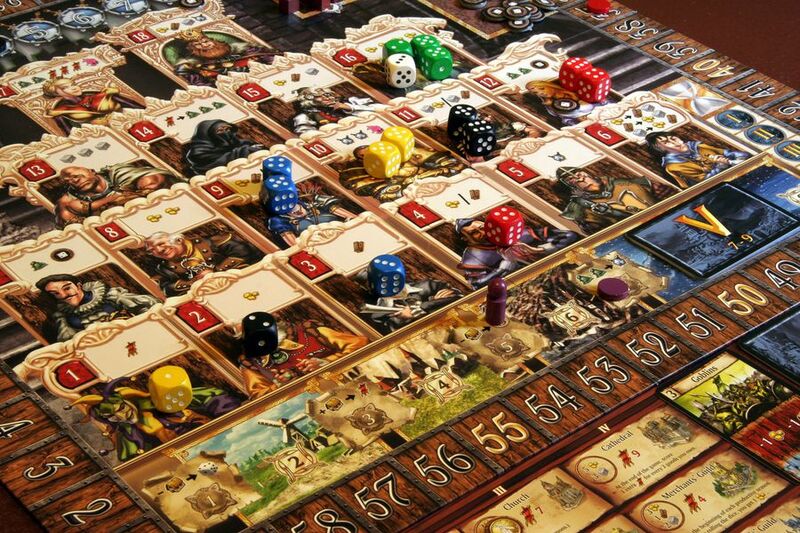 A fun and accessible entry in the Worker Placement field, Kingsburg is a game of dice as well. On your turn you throw three dice. The values on these dice determine the workers in the Kingdom you are eligible to select. For example, to access the King, whose value is 18, you have to throw three 6s. If you were to throw a 2, a, 3 and a 4, you could use each die individually or combine them in whatever combination you'd like. Be mindful, though, as you can't put dice where someone else already has placed dice. Village has a great story mechanic as well as its Worker Placement mechanic, and while I appreciate its story element, I think its deployment of the Worker Placement mechanic is perhaps the best implementation in contemporary gaming. You're trying to build a medieval village into its ideal form over the course of a few historical generations defined by game pieces in the community graveyard.